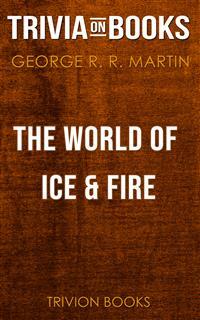 Trivia-on-Book: The World of Ice & Fire by George R. R. Martin Take the challenge and share it with friends and family for a time of fun! You may have read the book, but not have liked it. You may have liked the book, but not be a fan. You may call yourself a fan, but few truly are. Are you a fan? Trivia-on-Books is an independently curated trivia quiz on the book for readers, students, and fans alike. If you're ready to take the challenge yourself or share it with friends and family for a time of fun, Trivia-on-Books provides a unique approach to the book that is both insightful and educational! Features You'll Find Inside: • 30 Multiple choice questions on the book, plots, characters, and author • Insightful commentary to answer every question • Complementary quiz material for yourself or your reading group • Results provided with scores to determine "status" Note: This is an unofficial trivia meant to supplement a reader’s experience to books they already love. Trivia-on-Books provides quality and value with a unique approach that is both insightful and educational. Copyright © 2018 by Trivion Books. All Rights Reserved. As a Thank You, we’ve included a completely FREE gift of our All-TimeTop 5 Bestselling Kindle Trivia-On-Books to our readers FREE. In the Dawn Age, what was one of the only two creatures to have existed?